Many people ask me how I get such great photos of my dog Lacey. Lacey would tell you I have nothing to do with it besides pressing the shutter on the camera because she is naturally adorable. I would tell you I bribe Lacey with treats to take cute dog pictures. And Lacey is naturally adorable. I can't deny that! Lacey has to earn all of her treats. Sometimes she doesn't realize she is earning a treat when we are doing behavioral training to help her with her fear and anxiety issues. Lacey just thinks we make it rain treats in scary to her situations because we are the most awesome humans a dog could ever have! Neither Husband nor I will dispute this. Now that Lacey is conquering some her fears, more often than not, Lacey earns a treat for a sit/stay via hand signals only (brag) on the other side of the room where I am working on a project I have spread out on the floor and that I don't want her walking onto or into the step by step photos I have take for the tutorials I write on my DIY blog Condo Blue. So yeah. We go through dog treats quite a bit around here. One of the best ways to keep us with a constantly supply, is to make dog treats. That way, I know exactly what is in them because dog food and treats are not regulated like human food. Some companies can and do use spoiled people food to make dog food and treats and I like to avoid that at all costs. Fortunately this is a low cost natural dog treat recipe because carrots are one of the least expensive fresh vegetables at the market. The treats I made for this post cost even less than that. I bought a bag of fresh baby carrots the grocery store put on the reduced produce shelf because the bag was mangled but intact and within the expiration date. An even cheaper way to make carrot jerky dog treats? Don't mind if I do. You can also use this recipe, or tutorial actually, to dehydrate fresh carrots and preserve them for humans too. I am using a dehydrator for this project. If you don't have a dehydrator (Husband bought me a Nesco Dehydrator and I love it!) 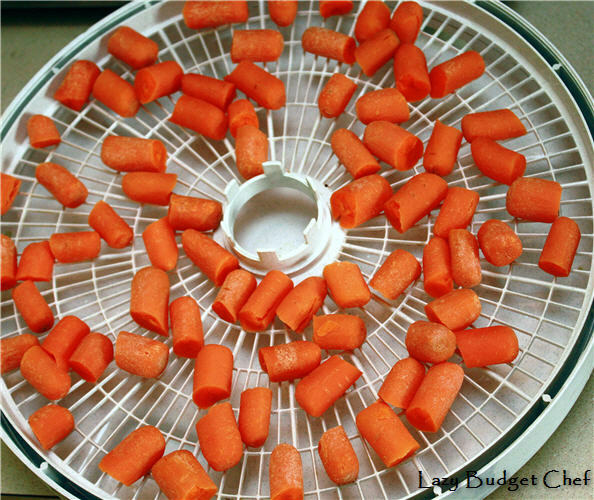 you can make the carrot dog chews in the oven although they may not be as dry as the dehydrator method. I would store those m in the refrigerator or freezer just in case. 1. Use the vegetable peeler to remove the skin from the carrots if desired. I like to keep the skin on because it contains a lot of nutrients. I wash my carrots with water and a vegetable brush instead. 2. Use the knife to slice the carrots into snack sized bites. For this tutorial I am skipping Steps 1 and 2 because I am using baby carrots to make dog treats. 3. 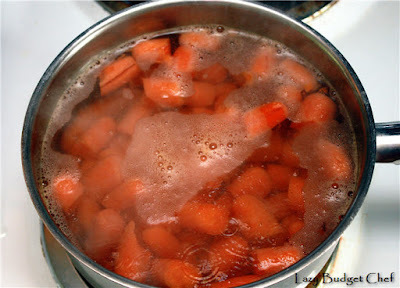 Blanche the carrot slices by dropping them into the pot of boiling water until the carrots are completely heated through but not cooked. It should only take a few minutes to do this. Blanching the carrots before you dehydrate them allows the moisture to escape the vegetables more easily and allows them to rehydrate faster but if you forget to blanch before you dehydrate your carrots (like I sometimes do) it isn’t the end of the world but it might take a little longer for the carrots to dry fully. 5. 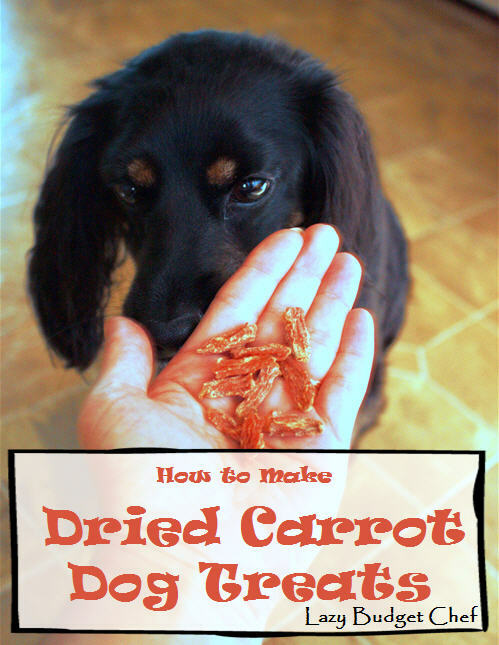 Dry the carrots into dog treats. Oven method: Place the carrot slices on the cookie sheet and bake in a 250 degree oven for two hours. Remove the carrot slices from the oven and turn them over on the cookie sheet. Bake the carrot for two more hours. Total baking time: four hours or more depending upon the thickness of the slice. Note: the oven dried carrot treats may have a similar consistency as my homemade sweet potato dog chew recipe. You should store the oven dried carrot chews in an airtight container in the refrigerator or for a little longer in the freezer. Dehydrator method: Dry the carrot at 135 degrees (F) for two to ten hours or more depending upon the thickness of the slice. Rotating the trays in the dehydrator will make sure everything dries evenly and may speed up your drying time. 6. After the carrot jerky treats cool, treat your dog right!